The next big breakthrough in ITC will involve sustained high-tech communication channels with the other side… with the spirit worlds… to allow world-changing information to stream into our world… information that could quickly transform the Earth into a nobler place… maybe a paradise. What forces must come together to make that happen? That’s what we’ll explore here. Before looking at that future breakthrough, though, it helps to review some of the past breakthroughs that have gotten us here… to the threshold of paradise. In a darkened room in his great laboratory, surrounded with beakers, generators, and other experimental equipment, Edison set up a photoelectric cell. A tiny pencil of light, coming from a powerful lamp, bored through the darkness and struck the active surface of this cell, where it was transformed instantly into a feeble electric current. Any object, no matter how thin, transparent or small, would cause a registration on the cell if it cut through the beam…. 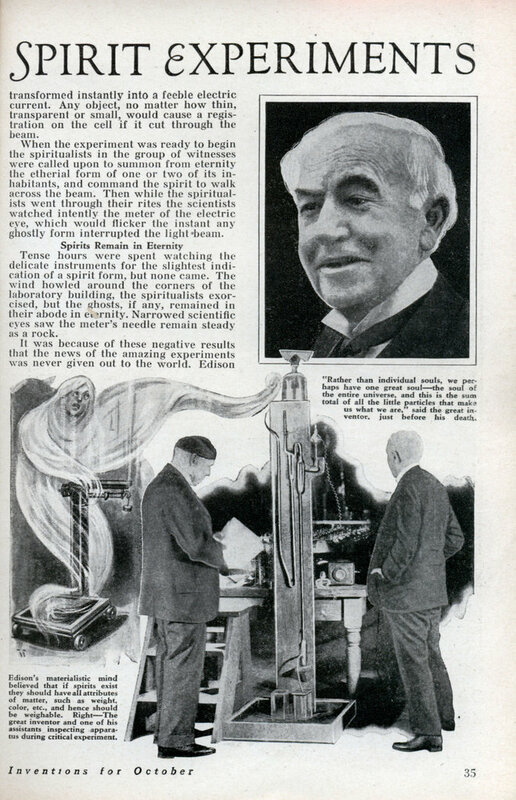 Afterlife experiments conducted by Tom Edison in the 1920s were the subject of an article in ‘Modern Mechanix,’ October 1933. Most spirits passing through our light spectrum have a very fine vibration (way beyond the electromagnetic spectrum of our world) and have no noticeable effects on our light, our energy, and our matter. The exceptions might be dense, earthbound, often confused and troubled spirits at the second level, or dismal realm, who do sometimes affect the matter and energies of our world… popping up in pictures, hijacking the carnal vehicles (bodies) of schizophrenics and addicts and alcoholics, rattling our mediums, causing bumps in the night…. Who wants to contact those guys, anyway… those dense, troubled spirits? Well, there are people who do make an effort to contact the second level… for various reason… for better or worse… ranging from psychics who help police solve crimes… to Ouija kids who woo the woo-woo for a thrill. Between those extremes are paranormal investigators, EVP experimenters, psychical researchers, and others. In my opinion, ITC researchers need to be a cut above. ITC researchers have to establish bridges to the mid-astral realm or “third spirit level,” where human dispositions are much as they were on Earth, though people there are more trusting and collaborative… and generally of good will toward each other and toward us on Earth… what little they may remember of the Earth. By the time a person dies and gets settled into the third level, his life on Earth has faded away into the recesses of the mind… like a dream. That’s because a person can’t live on the third level while gripped by worldly drama. The vibrations of the spirit body and mind would become too chaotic. hTe earthy spirit would be incompatible with the third level. So, in order to adapt to the third spirit level, the recently lived Earth dramas fade to distant memories as the prominent mind becomes steeped in love, trust, and good will prevalent throughout the third level. People on the third level are a cut above us, in terms of a calm demeanor, and a big cut above the lost souls of the chaotic second level, or dismal realm. ITC researchers on Earth, as well as the resonant spirits on the third level, need to protect themselves and their bridges from the dark, unsavory spirit elements closer to Earth in vibration… those in the dismal realm or second level. ITC researchers have to work with cohesive spirit groups who have at heart the best interests of their colleagues on Earth and the bridge between them… knowledgeable spirits who know how to transduce the fine energies of their world to work safely and effectively with our electromagnetic energies. Spiricom, 1980. The first major breakthrough in technical spirit communication came 60 years after Edison’s work. 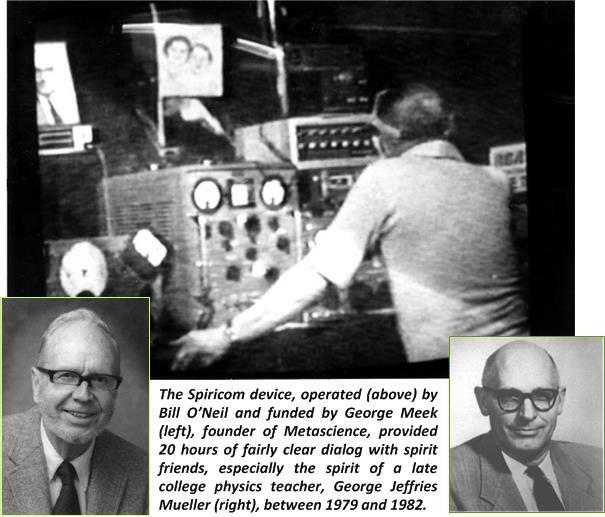 In 1979, George Meek and Bill O’Neil developed the Spiricom device. Over the course of four years, they enjoyed 20 hours of dialog with spirit friends, especially the late George Jeffries Mueller. I believe there are two main factors that let Meek succeed where Edison had failed… factors that took Spiricom dialogs a giant leap beyond the EVP contacts prevalent at the time. One was Meek’s attention to the contact field… what he referred to as a human energy field, or auric field. … energies involved in the different levels of the worlds of spirit are not a part of the electromagnetic spectrum as science presently knows it… it seems that some form of transformer, coupler or transducer must be utilized to serve as an interface between the energies of the “dead” and the energies used in our electronic devices…. (Spiricom) seems to use the auric energy field of one of our technicians (O’Neil) who is… clairvoyant… and whose energies have been utilized in a full body materialization of a spirit form. To date, our only extensive two-way conversations have been obtained when this technician is present in the room in which the equipment is located. The second factor in Meek’s success was the participation of a knowledgeable spirit group… It’s clear from various portions of the Spiricom dialogs that Bill O’Neil was not just talking to one spirit. When the voice of Doc Mueller, or Doc Nick before him, came through the Spiricom sounds, there were occasions when they had to turn away from O’Neil to confer to spirits around them. The spirit of Doc Mueller was being observed and was receiving guidance from other spirits nearby. Among those spirits I’m confident to say were ethereal beings with vast knowledge and ability to protect the communication bridge. Read more about George Meek and Spiricom here… and here…. While Doc Mueller was clever and insightful, the Spiricom dialogs didn’t provide any highly esoteric or world-changing knowledge from the finer realms of spirit… but, then, enlightening humanity apparently wasn’t the goal in 1980. The ethereal beings coordinating the project apparently had a simpler agenda. Their purpose for Spiricom, I believe, was mostly to get our attention… by giving us just a glimpse into the afterlife. Listen to O’Neil and Mueller vent some of their frustrations about the time differences between Earth and the afterlife. Spiricom gave afterlife researchers a few important insights about the spirit worlds and how they interact with our world. Researchers in Europe began to combine Thomas Edison’s intent and tenacity with George Meek’s knowledge of other-worldly energies and spirit groups, and the results were simply stunning. ITC bridges began to sprout in Europe in the mid-1980s, as spirit groups began to work closely with a few select researchers—Hans-Otto Koenig, Klaus Schreiber, Marcello Bacci, Maggy Harsch, Adolf Homes, Friedrich Malkhoff, and some others. Miraculous contacts began to happen, long dialogs through radio sounds, spirit-world images flashing on TV screens, telephone calls from the other side, files of text and images planted in computers by invisible hands…. Conditions seemed ripe for ITC to become a powerful force in the world. ITC bridges would open up to stream spiritual understanding, wisdom, and world-changing information to Earth… for the good of all humankind. I was a founding member of INIT, a team of researchers from various nationalities and cultures who shared a few things in common, at least during the first couple of years… before troubles developed. We all knew, at the core of our being, that the work we were doing was legitimate… that we were all honest and sincere. We trusted each other. We felt united on a very important, common quest: to open communication channels with the other side, for the betterment of the world. As most of you readers have noticed, this website is built to a large degree upon the results of our INIT group between 1995 and 2000. We enjoyed what I regard as the greatest miracles that have come to our world since the days of ancient Babylon (the beginning of the Second Epoch)… from breathtaking descriptions of the afterlife by those who live there, to mind-boggling accounts of our ancient heritage here on Earth, many millions of years ago, described to us by ethereal beings who’ve been monitoring humanity for billions of year (yes, we humans have been around much, much longer than scientists would have us believe!). With the support and guidance of our spirit friends, we were all ready to see the world transform in a most wonderful way… until our group unraveled amid personality conflicts. Even though INIT was together for only about five years, we learned enough about ITC to prepare for the final phase: a lasting planetary connection to the finer worlds of spirit that will allow unlimited knowledge to stream into our world through our technologies. When humans are ready mentally and spiritually, those bridges will open wide. Good souls in the spirit worlds are ready for ITC bridges to be opened with Earth. They have always been ready and waiting… waiting for us on Earth to rise to the occasion. And here’s what it will take for us to rise to the occasion. These are what I regard as the main puzzle pieces for world ITC. They are often overlooked in popular histories and analyses of the research. Respect and appreciation for the spirit groups. Each researcher with an ITC bridge will work with his or her own spirit group. For years I assumed it was INIT on our side working with the Timestream spirit group on their side. In fact, the Harsch-Fischbach couple had developed a rapport with Timestream. Adolf Homes attracted a spirit group called Centrale. The Cloverleaf group formed around Friedrich Malkhoff. My spirit group never had a name, as far as I know, but members of the group included Willis Harman, Bill O’Neil, Arthur Beckwith, and an ethereal being named Isar. Receptivity to spirit energies beyond the electromagnetic range, which will be provided by spirit. The most important of these is resonance. Once humans learn to work together over time with sustained, mutual respect and trust and friendship… ITC will become the new cornerstone of terrestrial life. It will become the foundation of science, religion, and government. This entry was posted in Heaven and Earth, Inner exploration, ITC, Our paradise destiny, Spiritual realms and tagged bill o'neil, doc mueller, future of ITC, George Meek, next big ITC breakthrough, resonance. Bookmark the permalink. Thank you Mark. I enjoyed this writing greatly because I know it to be true. This kind of thinking and knowing refreshes me. However, I believe that the connections between spirit and earth side are more than mere imagination. I believe that this collaborative bridge between earth life and spirit life is what will allow life on this plane to survive itself and enter a new golden epoch. The consciousness of humanity will evolve and solutions to our worldly problems will blossom and manifest as the needed change. Just as in the cultures of our ancestors who lived in golden ages, problems like money and the strife that money, creates will just dissolve and go away. With the aid of the consciousness of spirit side beings, we will be able to build great things for the sake of all of earth life, like the pyramids; a construction which defies current building methods and capabilities still. “What if this is Heaven?? ?”…thought I…!!!! Yikes….we have some work to do to clean up this Heaven. I still see earth life as a classroom extension of Heaven, just one of many special places that we enter through the revolving doors of existence. Life here will be improved, Such is my imagination. I greatly enjoyed this posting and the links to the old writings. Thank you.